As management ages and prepares to work longer than previous generations and Millennials join companies at steady rate, companies are suffering through tension and dissonance between Millennials and Boomers, and realizing that they can't just wait for management to age out to fix it. Finding productive ways to work across the generation gap is essential, and the organizations that do this well will have significant strategic advantages over those that don't. 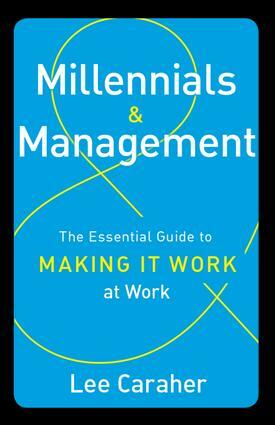 Millennials & Management: The Essential Guide to Making It Work at Work addresses a very real concern of large and small businesses nationwide: how to motivate, collaborate with, and manage the millennial generation, who now make up almost 50% of the American workforce. The key is to change Boomer attitudes from disbelief and derision to acceptance and respect without giving up work standards. Using real world examples, author Lee Caraher gives leaders data-driven steps to take to co-create a productive workplace for today and tomorrow.